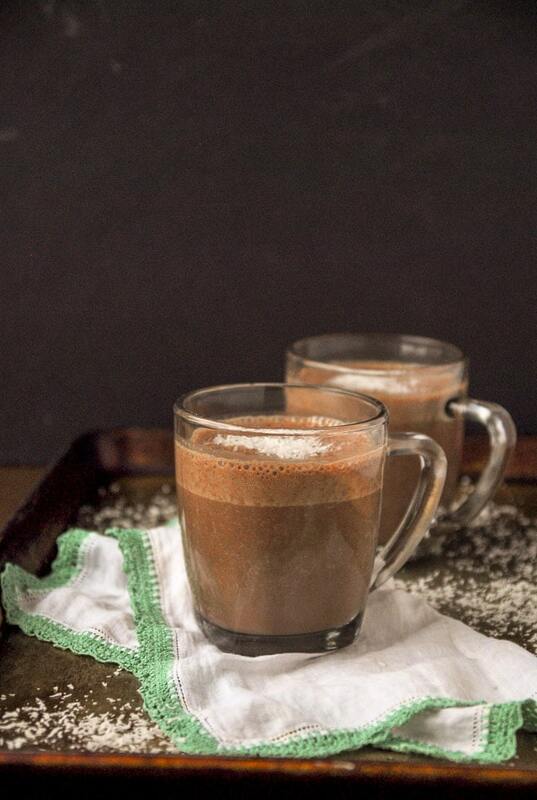 Creamy coconut milk makes this easy vegan hot chocolate even better than the packaged stuff. Best of all, it’s ready in just 5 minutes! I wasn’t really sure if we had bypassed hot chocolate season, or if it still felt like an all around winter drink. I feel like hot chocolate goes all gang busters around Christmas, but then it gets neglected right away after all the lights and decorations are long gone. Me? I’ll drink vegan hot chocolate anytime during the cooler months, especially if it isn’t the powdered stuff. Honestly, I used to LOVE the hot chocolate with the tiny marshmallows in the package. We didn’t get it all the time, but when we did, it was the hot chocolate I always made a beeline for. Not only are you drinking a mug of piping hot melted chocolate (ok chocolate powder thing), but there were also a mess of cute little marshmallows floating around and getting all melty at the same time. Who can beat that? Now that I know how easy it is make homemade vegan hot chocolate, I will abandon the packaged stuff for the cup of real deal chocolate anyday! Ever since I got this baby, which is now my favorite kitchen appliance, I can’t stop finding recipes to use it for, including this hot chocolate. If you don’t have a Vitamix, this is just as easy to make on the stovetop and takes just as long. My favorite vegan chocolate to use in this recipe is the big bar of dark chocolate from Trader Joe’s, which ends up being pretty good quality and fairly cheap (although we burn through them like nobody’s business around here). Since I made mine in the blender I added a handful of shredded coconut to the hot chocolate itself, but feel free to leave that out if you are cooking on the stovetop. Also, word to the wise, this is just as good piping hot and after it’s chilled in the freezer for a bit, so either way, this dessert-y drink is perfect! 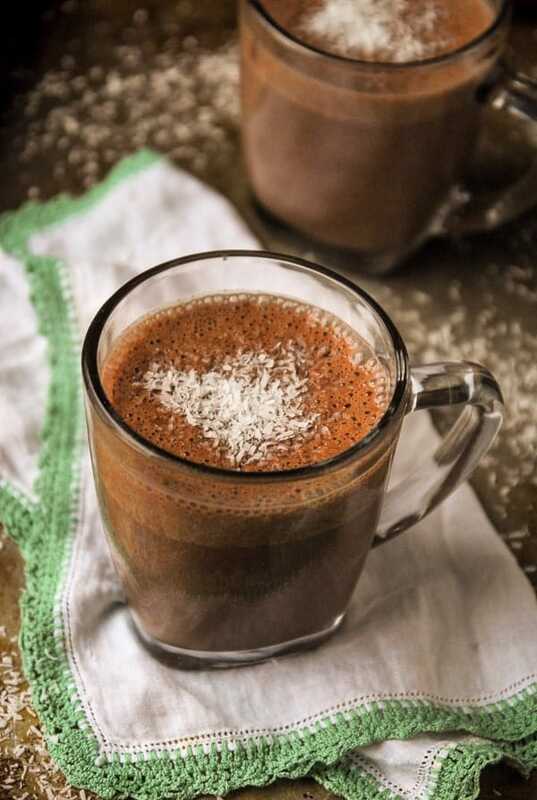 Because this coconut vegan hot chocolate uses so few ingredients, it’s important that you buy the best quality that you can. For this coconut hot chocolate recipe, I used light coconut milk (make sure your coconut milk is free of weird additives and thickeners! ), real chocolate, and pure vanilla extract. That’s it! If you want to be extra cute, you can keep this vegan hot chocolate warming in a slow cooker whenever you have guests over. Put some shredded coconut in a bowl next to the mugs and let guests serve themselves. (Bonus points if you’ve whipped up a batch of vegan marshmallows to go with your cocoa!). To make on the stovetop: Combine all the ingredients, except for the shredded coconut, and cook on medium heat until chocolate pieces are completely melted. Pour into mugs and garnish with shredded coconut. To make in a high-powered blender: Combine all ingredients, except for the shredded coconut and blend on high until hot and mixture is completely blended. Garnish with shredded coconut. I got a Vitamix as a gift a few years ago. It’s pretty much the best kitchen appliance you can imagine. 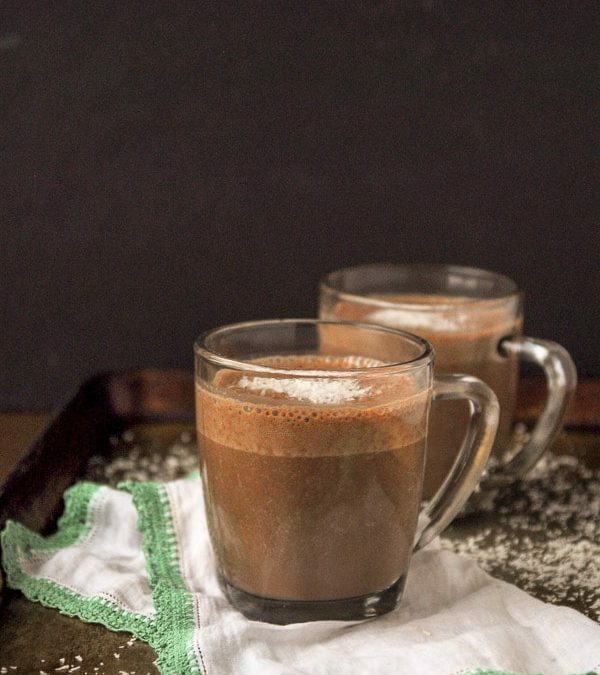 I love how it frothed your cocoa– it’s like vegan chocolate whipped cream! It really is the BEST, right?! That’s all the Vitamix right there, so easy and fast! I need to pick up some coconut milk. This sounds so delicious, and I love the ease of just putting everything into the Vitamix. Does the coconut milk add a strong coconut flavor? Hi Jerry, I don’t think it does, but I also love coconut! It is more of a slight hint of coconut flavor. I’m looking at my mug of coffee wishing it was a mug of this delicious hot chocolate. I love that you used legit chocolate for the recipe, and coconut milk? Sign.me.right.up!!! I’ll drink this thang all winter/summer long!! Legit chocolate. All the way! I’ve surprisingly met a lot of people who like more watery hot chocolate, but I prefer rich ones like this – especially with the coconut milk! Oh man, I just can’t do watery hot chocolate! I agree Alisa, rich and creamy is the way to go! Okay, that’s it. I need some coconut milk and stat to make this. Looks amazing! 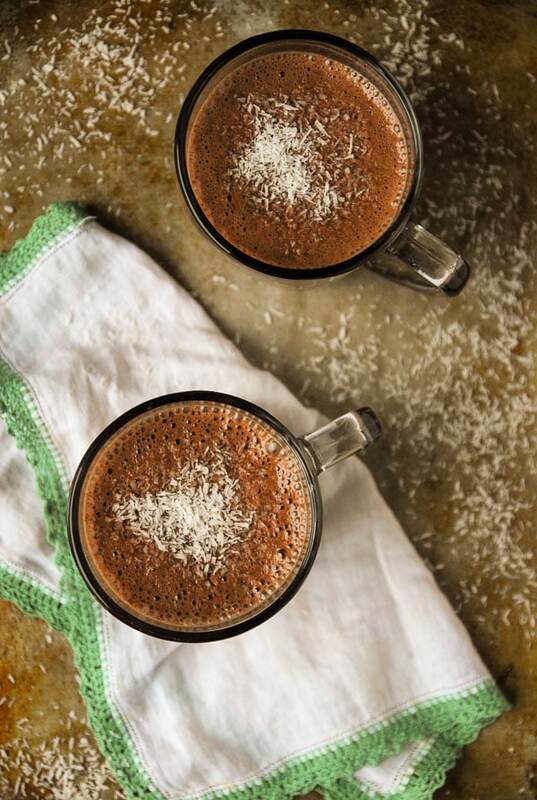 Hot chocolate is definitely a year-round thing, particularly when it involves coconut. Yum! I love this so much! I need it to warm me up! Right? I know there are coconut haters out there, but I don’t see why! Wish I had a warm mug of this in front of me now! oooo hot chocolate with coconut milk?? you don’t have to be vegan for that to sound amazing! will have to try this soon. Agreed! Vegan or not, this is amazing! Hot chocolate is definitely not just a Christmas drink in my book. I don’t drink tea/coffee so it is my hot drink of choice when I need something warm and indulgent. 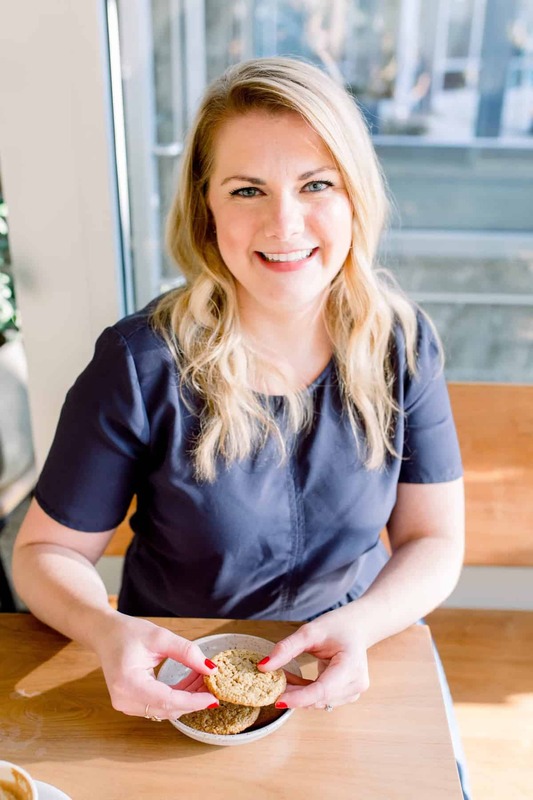 I love the idea of using coconut milk – so rich + creamy! Same here! Ok glad I’m not alone in loving hot chocolate ALL the time! Never thought of topping my hot chocolate with coconut, but it sounds really good.